Little Park End is situated in the peaceful North Tyne valley in Northumberland, England’s most northerly county. For over 1000 years the area was riven by warfare and conflict, Hadrian’s Wall is nearby and Little Park End is within easy reach of the magnificent atmospheric central section, the Roman Forts of Chesters and Housesteads and the unique archaeological treasures of Vindolanda. The violent dark ages of the Saxons and Vikings were followed in the middle ages by open warfare between England and Scotland. Marauding armies and itinerant raiders used the North Tyne Valley as a highway for attack and rapid escape The conflict in latter centuries is clearly visible in the pele towers, castles and defensive houses which are still to be seen throughout the county, some in a ruinous state but many still inhabited. The North Tyne valley is within easy reach of the attractive market towns of Hexham, Morpeth and Alnwick. If preferred the cities of Newcastle with its art galleries, theatres and historic quayside and Durham’s world heritage site of castle and cathedral are near enough to visit for the day. Other attractions include the upland areas of the Cheviot and Simonside Hills and the Northumberland Coast. Very popular is the observatory by Kielder Water, Europe’s largest man made lake which is in the middle of the National Park dark skies area, and the bird of prey centre at Stonehaugh. 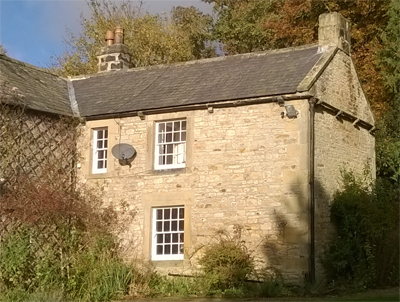 Owl Cottage will be available to rent from March 2017 for holidays and short breaks. Guests will usually be self catering but breakfast may be provided on request. There is a dining kitchen with an AGA cooker, a double and a single bedroom with a pull out second bed. There is also a comfortable sofa bed in the living room. There is a garden which may be used by guests and a number of good pubs, restaurants, and cafes in the attractive neighbouring villages. Prices will range between £290 – £490 for a week depending on the season.